AMSA 2017 was held at the Doubletree Hilton / Darwin Entertainment Centre complex on the Esplanade in Darwin. It marked the return to the Top End after twelve years. The theme was ‘Connections through Shallow Seas’, which served to highlight the shallow Timor and Arafura Seas to Australia’s north and the various connections, biophysical and cultural. This conference brought in the latter to emphasise the relevance of a social element in communicating marine science effectively, and the value of working in partnerships with Indigenous communities and regionally with neighbour countries. Northern Australia, and Darwin specifically, was an entirely apt location for the 54th AMSA annual conference. National attention has been drawn to Northern Development, but the marine environment had until now been pushed to the background by a land-based political focus. About 340 delegates attended the conference, with significant representation from Asian nations (including 20 from Indonesia). Almost 270 presentations were brought together in a diverse scientific program of 17 symposia and four general sessions. We continued the initiative from AMSA 2015 with PEP talks (five-minute oral presentation with conference-long digital poster) replacing traditional posters, and extended to operate the conference under an ‘Eventranet’ web site. The conference began with a stirring Welcome to Country given by Larrakia elder Tony Lee. The Northern Territory Minister for Environment and Natural Resources Lauren Moss declared AMSA 2017 officially open. Plenary sessions were pivotal to AMSA 2017 and featured an array of rousing and topical talks. Helene Marsh launched the scientific program, picking up the conference theme with ‘Ecological and cultural connections through coastal seas enabled by marine megafauna’. Tim Moltmann followed with ‘Implementing the National Marine Science Plan’. The plenary address on Tuesday morning was given by Julie Hall, providing perspective from New Zealand with ‘Integrating social science, economics, indigenous knowledge and marine science to underpin decision making for management of our marine environment’. Nic Bax returned to Australia: ‘2016 State of Environment Report for the Marine Environment. Where are we and where might we be going?'. The plenary session on the second day concluded with ´'Traditional management of marine resources in the Torres Strait’, given by Hilda Mosby and Frank Loban of the Torres Strai Regional Authority. Wednesday was given over first to the winner of the AMSA Silver Jubilee Award: Peter Steinberg reflected on 'Drugs, bugs and seaweeds: multidisciplinary marine science'. Alistair Hobday followed with a plenary address on ‘Bluefin, connectivity, climate, and adaptation’, and few will forget his exhortation to communicate science as optimists, rather than doomsayers. Thursday’s plenary had a different flavour in celebrating a decade of IMOS, with four inspiring invited talks from Moninya Roughan, Richard Brinkman, Robert Harcourt and Anthony Richardson. 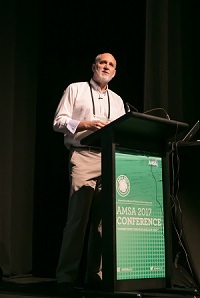 AMSA 2017 continued the recent tradition of a Public Forum. It was held on the Monday evening; the topic was: 'Northern Development – How does marine fit? | Australia’s Shallow Tropical Seas – Resource and/or Refuge?' Along with marine scientists, the panel comprised representatives of Traditional Owners, government, industry, and NGOs. A wide-ranging discussion was had, very ably convened and facilitated by Luke Bowen (NT Department of Trade, Business and Innovation). 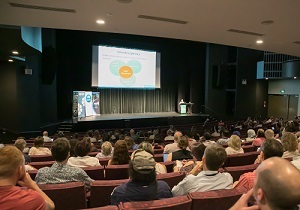 A consensus across the panel seemed to be that the marine realm needed to feature more strongly in the conversation on Northern Development, recognising the overwhelming ownership of coastal regions in northern Australia by Traditional Owners, and with the proviso that it was overseen by effective ecosystem-based management. Associated with the scientific program was a supporting series of workshops. These were diverse, ranging across Indigenous Engagement, 'Getting Published' (for postgraduate students and early career researchers), 'Using Novel Technologies to Answer Key Questions in Marine Science', and 'Connectivity and Coastal Habitat Utilisation' (including a sunset cruise on inner Darwin Harbour). The Indigenous Engagement Workshop was a standout in providing compelling examples of two-way partnerships encompassing Traditional Ecological Knowledge and western science. Social activities were also prominent with the Icebreaker to begin--in the Reflections Room (exhibition space) and Water Gardens of the conference venue Doubletree Hilton Darwin Esplanade, and a student night (with all delegates invited) at a local tavern on the Darwin waterfront that kept everyone entertained with a trivia quiz. 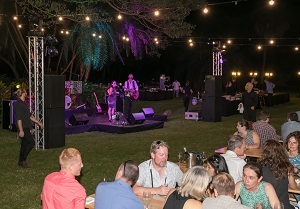 The Gala Conference Dinner was a striking example of Territory lifestyle, held under lights in the open in the Darwin Botanic Gardens. It had an air of informality and variety, but still incorporated the perennial events (Student Awards, Photographic Competition prizes and the Sherwood Award). The local band 'The Kicks' inspired many to dance the evening away under the stars—not to forget the purple-lit boab tree. The organising committee—Sharon Every, Samantha Nowland, Claire Streten, Kelly Mackarous, Vinay Udyawer, Katherine Dafforn, Krystle Keller, Shannon Burchert and Britta Decker (with earlier Karen Gibb, Jacqueline Taylor, Ruth Patterson and Madeline Goddard)—an outstanding job in bringing it all together. The scientific committee under Claire Streten's exemplary leadership (David Griffin, Maria Byrne, Lynnath Beckley, Robert McCauley, Alicia Sutton, Mark Meekan, Edward Butler and Ruth Patterson) put together an excellent and diverse program to suit national priorities. Working very commendably behind the scenes, and making it all function like clockwork was professional conference organiser Agentur (Britta and team) and the unflappable duo from Paperless Events (Angela and Andrew), driving the live conference Eventranet website so well. Traditional media activity was busy, expertly handled by Rachel Przeslawski, and social media was buzzing (the hashtag #AMSA2017 was trending in the top five nationally at times during the conference). In order to spread key messages from the conference widely, an AMSA 2017 communiqué has been released. This can be downloaded from the AMSA website (get it here).